On 23rd March, the CNCF wrapped it's first ever Kubernetes Day in Bengaluru. More 1300 participants registred and I believe ~900-1000 of showed up. It happened at Infosys Campus, in Electronic City. It was great to see such energy and interest during the event. CloudYuga was one of the sponsor and I was also one of the speaker. Having the event at our city is good in many ways. First of all, our entire team could attend the event and manage the booth. Secondly we got to interact with many community members, well-wishers and customers. 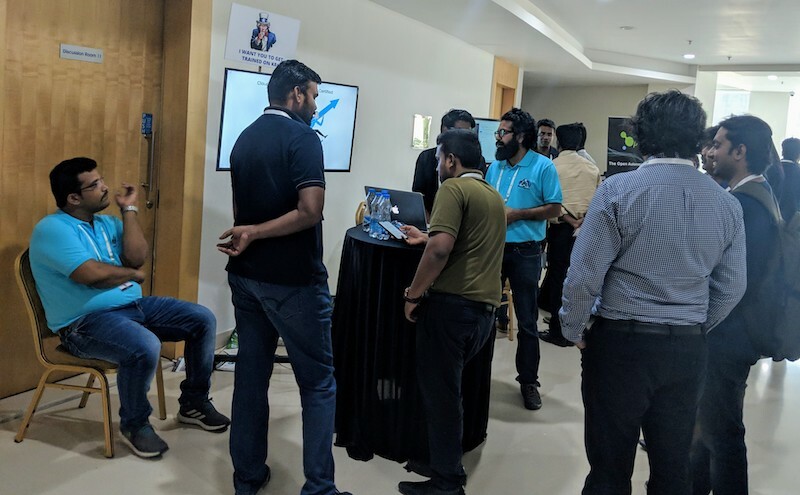 Our booth was always busy and during the interaction participants enquired about our offerings, asked questions about Kubernetes, Istio and so on. Some of them even purchased our self-paced online Certified Kubernetes Administrator(CKA) and Certified Kubernetes Application Developer (CKAD) courses, which we launched a day before. At the booth, we also offered a printed copy of kubectl's cheat-sheet, which was well received by the participants. Based on my talk - Noobernetes, we also did a quiz and handed over gift coupons to winners. The event was at par with any international event and I am very sure participants would have loved it. Thanks for the CNCF's event team for pulling it altogether.